Photo Front Row (Left to Right) Linda Hemmen, Peggy Valenti, Patrick Kreke, Rick Siemer, Rachel Miller, Jodi Cole and Henry Siemer. Back Row (left to right) Amanda Rieman, Jane Summers, Marty Watson, Kenny Stice and Pam Ruholl. 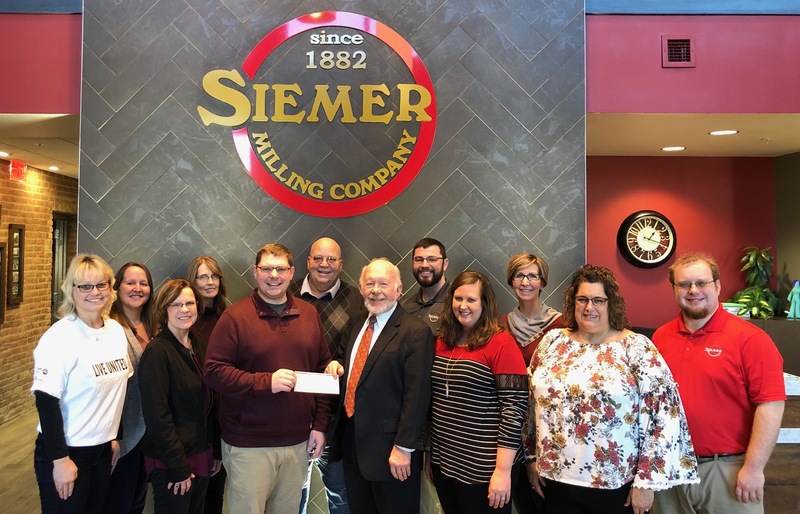 Rick Siemer and employees from Siemer Milling Company presented a check to Patrick Kreke, Campaign Chair and representatives from United Way of Effingham County. Donations raised through their employee and corporate campaign raised a total of $20,150 for their 2018 campaign. 24 local Partner Agencies receive funding from the Effingham County United Way campaign. Please call Linda Hemmen, at 217-342-3824 if questions.